The Wetaskiwin Summer Games Committee presented the Wetaskiwin Theatre Society with a cheque for $25,000.00 toward the stage lighting. 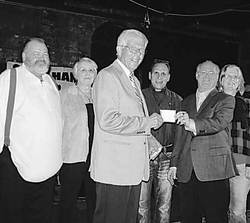 Russ Aney presented the cheque to Ted Eden with Eldon Roth, Dot Brekke, Dave Dowler and Laura Girvan looking on. This significant contribution toward the lighting was first announced in 2008. The presentation was made early in a Benefit Concert put on by Glad Hand, a local music group. Eldon Roth, the master-mind behind the redevelopment of the Water Works Building into a first class performing arts centre, had made a list of the next 35 items he wanted to accomplish in the renovations upon his return from a 38 day holiday. Ted Eden found the list and had all 35 items completed by the time Eldon got back. Such is the level of enthusiasm and willingness to work within the Society as the stage is usable, and the final goal is in sight. During this work of love, the Society has not borrowed, but has progressed with items bought and paid for or donated as needed. The frequent use of the stage and the number of groups putting on benefit concerts for the Theatre Society speak to the need for this facility. A simple way for everyone to contribute to this project is through the purchase of a $100 brick with the donor's name on it.